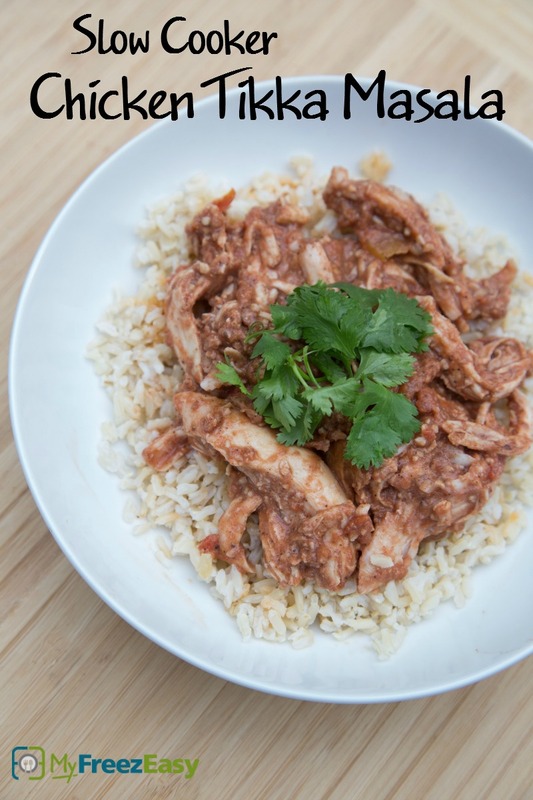 This is such a fabulous chicken dish…packed with flavor. It calls for a ‘specialty’ spice – garam masala. It’s a very ‘warm’ spice and is commonly used in Indian dishes. It’s a combo of cinnamon, cloves, cardamom and peppercorns. It’s not spicy…but very very flavorful. And it balances well with the tomato sauce and yogurt in this meal. Dice the onion. Peel and slice the ginger (about 8 thin slices). Cut the chicken into 1-inch pieces and place in the base of the slow cooker. Add the onion and ginger around the chicken. In a large mixing bowl, whisk together the crushed tomatoes, yogurt, minced garlic, garam masala and a few pinches of salt and pepper. Pour over the chicken in the slow cooker. Set on low and cook for 6 hours. 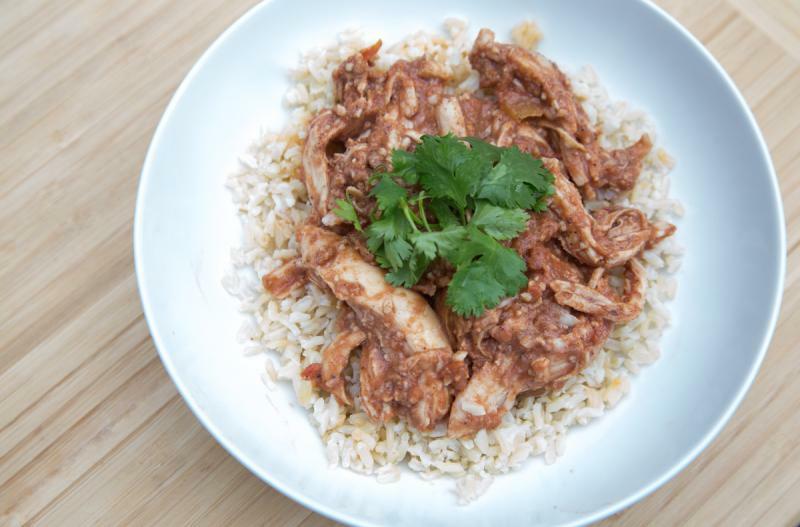 Serve Slow Cooker Chicken Tikka Masala with cilantro garnish over rice with side salad. Cut 16 chicken thighs into 1-inch pieces. Dice 2 onions. Peel and slice the ginger (about 8 thin slices). In a large mixing bowl, whisk together 2 cans of crushed tomatoes, 2 cups plain yogurt, 6 tsp, minced garlic, 4 tsp garam masala and a few pinches of salt and pepper. You could substitute 1 cup canned coconut milk for the yogurt to make a dairy-free meal. Serve over rice with side salad.